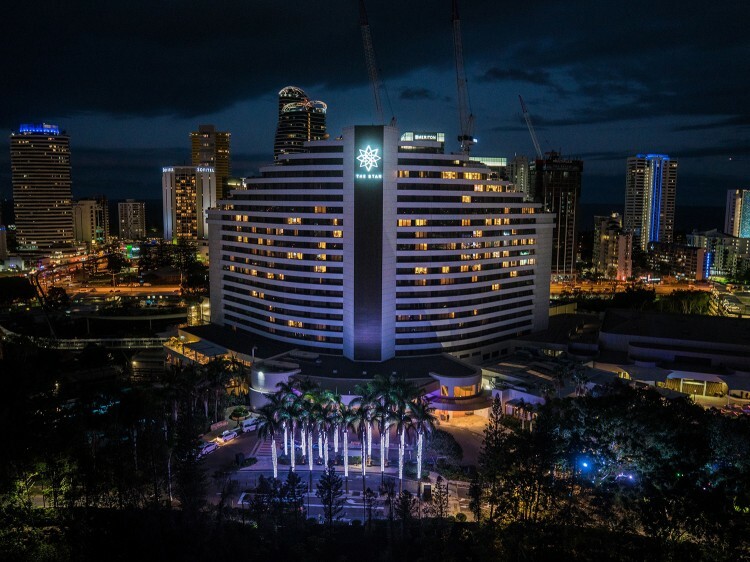 The Star Grand at The Star Gold Coast is a luxurious resort located in the heart of the Broadbeach, within walking distance to Pacific Fair & Oasis shopping centres and some of Australia's most pristine beaches. The Star Grand offers guests sumptuous dining, lively bars, a 24-hour casino, star studded entertainment, stunning pool, a day spa and fitness facility. As well as being a non-stop entertainment venue, The Star Grand also offers 13 function rooms for meetings, conferences, weddings, and festivities. 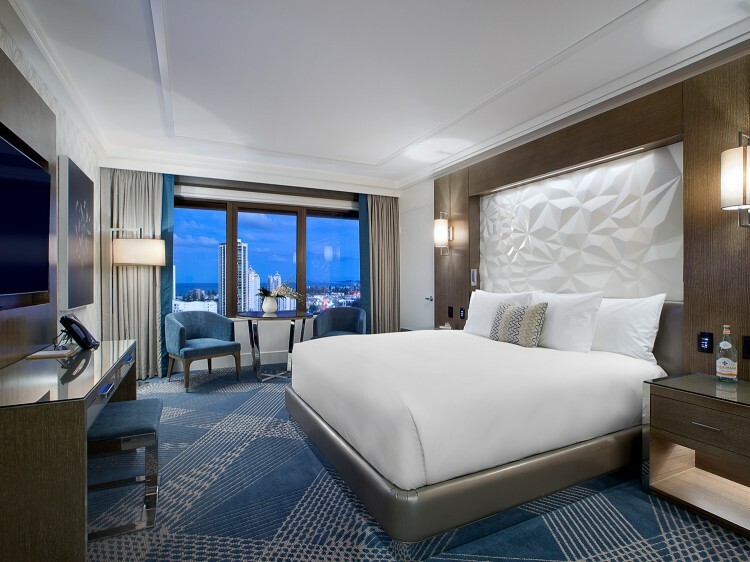 The 596 rooms at The Star Grand feature cable channels, in-house movies, 24-hour casino gaming channel, FREE high-speed Internet, and modern amenities. Guests enjoy breathtaking views of the beautiful Gold Coast hinterland. To arrange your stay at this top resort on the Gold Coast, Queensland, please see our rates and availability for The Star Grand at The Star Gold Coast. Enjoy the buzz and experience the trills. With over 70 table games and 1600 machines, there are endless ways to play. For a unique dining experience you will be hard pressed to find a better destination than The Star Gold Coast. Whatever the occasion, there is something for everyone. Please note special dining days/times apply over Christmas and New Year. Nineteen - introducing The Star Gold Coast’s new signature venue, Nineteen at The Star. Prepare for a sensory overload in our world class venue positioned 19 floors above the glittering Gold Coast, with a decadent rooftop restaurant and an uber-chic lounge bar that sweeps over the Pacific Ocean. Kiyomi - serving a modern, yet distinctly Japanese menu created by Executive Head Chef Chase Kojima, Kiyomi celebrates the experience of shared dining with an exciting food and beverage menu. Open for dinner Monday to Saturday from 5:30pm until late. Cucina Vivo - drawing on traditional Italian food culture, inspired by the cliff-top restaurants of the Amalfi Coast. Featuring an outdoor terrace overlooking the pool, the menu offers traditional favourites and inspired interpretations of the classics. Open for dinner Tuesday to Sunday from 5:30pm. M&G Cafe & Bar - a classic cafe with modern styling boasts light meals and snacks as well as more substantial options. Whether it's a quick coffee, or a catch up over cake, or a dinner date M&G is the perfect spot to relax and enjoy good company. Open Sunday to Thursday 6am to 10pm and Friday to Sunday 6am to 1am. Garden Kitchen & Bar - overlooking lush tropical gardens and lawn area, experience an eclectic mix of contemporary furnishings, cascading greenery and a generous dining area bathed in natural light. Open daily for lunch 12:00pm to 4:00pm and dinner 5:00pm to 10:00pm. Harvest Buffet - Prepare your senses for overload at the Gold Coast’s ultimate buffet experience. From the freshest seafood like oysters, prawns, sushi, crabs and mussels, to roasts from the carvery as well as crowd-pleasers like pizza, pasta, curries, soups and salads, there's something guaranteed to tickle your fancy. Or, perhaps we can tempt you with our decadent dessert bar - complete with chocolate fountain. Kids 0-4 years eat free. Open 7 days a week for breakfast, lunch and dinner. Imperial at The Star - previously Zen restaurant, Imperial at The Star focuses on highlighting traditional flavours, ingredients and cooking styles from different regions of China. Internationally trained Executive Chef of Asian Cuisine – Chef Song Yao Su has developed the menu drawing from his decades of experience overseas and his flair for combining traditional Mandarin and Cantonese ingredients producing inspired interpretations of Asian classics. Food Quarter - Food Quarter's fresh coastal palette and open plan design provides a bright and contemporary area that serves as the ideal casual dining space for lunch, dinner, coffee or a midnight snack! Whether you feel like a roast, Eastern cuisines, pizza, or a classic burger and chips - Food Quarter has your tastebuds sorted. Outdoor Bar - enjoy a drink on the sun-drenched deck overlooking lush tropical gardens and lawns or take it inside to the 13 metre indoor bar. Live music happens on the deck every Friday, Saturday and Sunday. 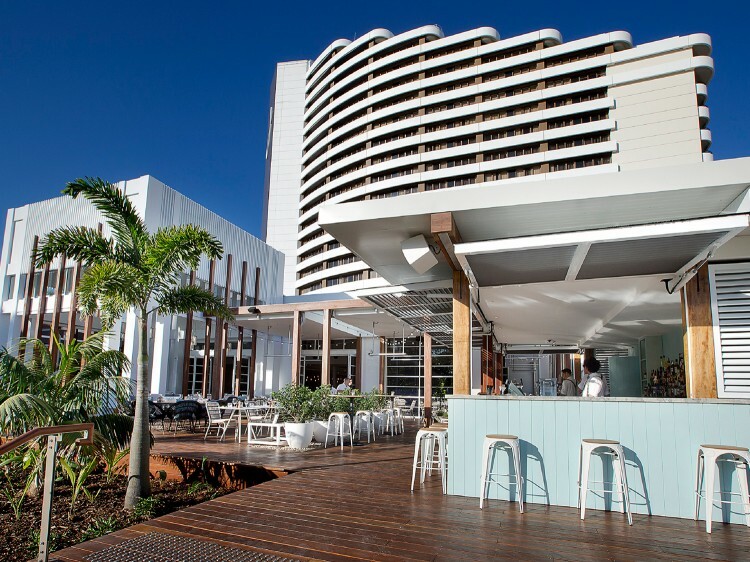 Atrium Bar - this Gold Coast institution has hosted millions of locals and tourists alike. Offering an extensive selection of cocktails, local and imported beers, wine and spirits plus free live entertainment Tuesday, Friday and Saturday. Cherry - Enjoy a sumptuous setting and designer drinks along with a signature seasonal cocktail menu crafted by The Star’s highly-talented team of mixologists.The epitome of sophistication and luxe, Cherry features a lavish 22 metre bar in the heart of the action. Sports Bar - The Star Gold Coast's home of live sports with a huge 162 x 92 inch widescreen TV, heaps of other TVs and TAB facilities so you never miss a minute of the action. Sit back and enjoy the extensive range of local and imported beers, wines and spirits. 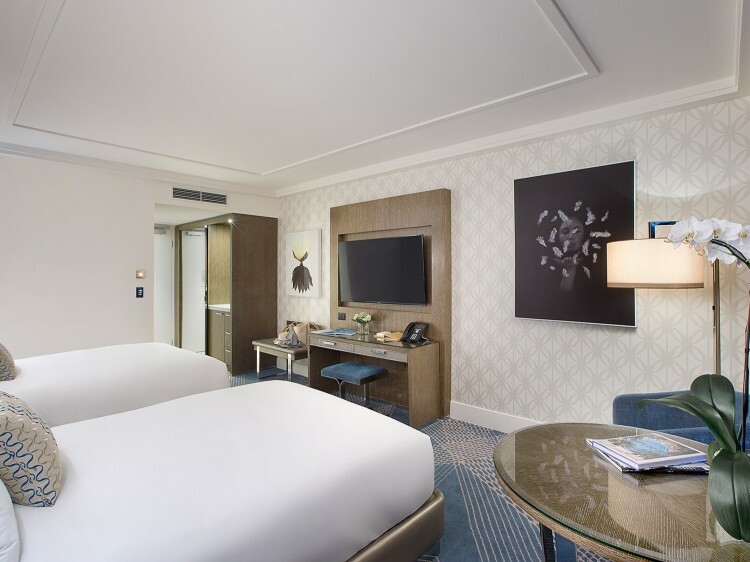 Executive Lounge and Floor privileges include VIP express check-in, pressing of two garments upon arrival, complimentary buffet breakfast, refreshments, drinks and canapés, use of the business centre facilities, evening turn down and room refresh and valet parking. Customers must be over 18 years to enter the Executive Lounge. Drinks and canapés served daily between 5.00pm and 7.00pm. The Star Gold Coast practises the responsible service of alcohol. Following the completion of our current transformation, including the opening of our luxury suite hotel The Darling, we will continue to develop our world-class integrated resort with construction on a new 700-key hotel and apartment tower starting later in 2018. During this time, hotel guests may experience noise disturbance from 7am to 7pm however every effort is being made to minimise any disruption. We apologise for any inconvenience and appreciate your understanding as we work to create exciting new experiences for you to enjoy during your next stay. Recently fully refurbished, state-of-the-art rooms offer an unprecedented level of personalisation. Personalise your room at the touch of a button, from opening your blinds to adjusting the room temperature, then sit back and relax while your room transforms into your own private oasis. Offering a king bed, The Star Entertainment Group's signature range of luxurious bedding and pillows, L’OCCITANE bathing amenities and entrance to Jupiters Fitness. Average room size is 32sqm. Recently fully refurbished, state-of-the-art rooms offer an unprecedented level of personalisation. Personalise your room at the touch of a button, from opening your blinds to adjusting the room temperature, then sit back and relax while your room transforms into your own private oasis. Offering two double beds, The Star Entertainment Group's signature range of luxurious bedding and pillows, L’OCCITANE bathing amenities, entrance to Jupiters Fitness. Average room size is 32sqm. Recently fully refurbished, state-of-the-art rooms offer an unprecedented level of personalisation. Personalise your room at the touch of a button, from opening your blinds to adjusting the room temperature, then sit back and relax while your room transforms into your own private oasis. Offering a king bed, The Star Entertainment Group's signature range of luxurious bedding and pillows, L’OCCITANE bathing amenities, entrance to Jupiters Fitness. Average room size is 32sqm. Lavishly appointed, located on floors 14 to 17 and as with the other Suites they feature open plan living, complete with a kitchen, bar, private balcony and Executive Floor privileges*. Average room size is 81sqm. Free self parking; valet parking available for $50 per day.